We'd like to take the time here to remember Military Atheists and Secular Humanist - Ft. Bragg members who have died, to make sure they and their service is not forgotten! While serving with the 3rd Battalion 37th Field Artillery unit in Germany in November of 1976 at Darmstadt Hesse, Gary was inducted into the Sergeant Morales Club. 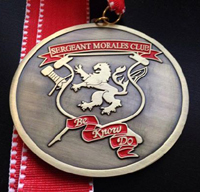 The Sergeant Morales Club (SMC) was established in 1973 by Lt. Gen. George S. Blanchard to promote the highest ideals of integrity, professionalism and leadership for the enlisted force serving in Europe. SMC members exemplify a special kind of leadership characterized by a personal concern for the needs, training, development and welfare of Soldiers. SMC membership recognizes and rewards distinguished NCOs whose leadership achievements merit special recognition and who have contributed significantly to developing a professional NCO Corps and a combat-effective Army. "I was always impressed with Gary's determination to remain involved in MASH despite his health issues. It was such a task for him to bring his O2 tank and timing his arrival so he wouldn't run out of oxygen during our meetings." Robyn, MASH Member.